These theories aim to fill in a sizeable gap in the story of a specific game. Example: The Gerudo became the Twili in Twilight Princess. These theories attempt to impose a sense of order on the shared universe of the games. Example: Breath of the Wild is set in the distant future of the Twilight Princess timeline. These theories offer a deep reading of the stories, characters, and themes of the games. Example: Majora’s Mask is based on the five stages of grief. These theories go out of their way to hurt you by providing the darkest possible interpretation of a specific story element. Example: Navi dies at the end of Ocarina of Time. These theories go beyond “dark theories” in that their only purpose is to keep you awake at night. Example: Link recovers his energy by eating the bloody raw hearts of the enemies he slays. What are these theories, what are they even. Example: Ganondorf and Princess Zelda are secretly dating. I’m not going to try to organize the theories I’ve collected by this typology, however, because they’re all over the place. Some are silly, some are creepy, some are actually plausible, and some are genuinely bizarre. Like urban legends, these theories have been circulated by word of mouth on online message boards. Some of the oldest appeared on the forums of Something Awful and Albino Blacksheep, and the more recent spread by means of Reddit and Imgur. Essentially, wherever people get together to have conversations about video games, someone always has a Zelda theory to share. In no particular order, here are some of the theories that have caught my attention. – Paya, Impa’s granddaughter in Breath of the Wild, is shy around Link because she doesn’t often get the chance to interact with people her own age. Almost every Sheikah teenager leaves to join the Yiga Clan, which is why there are so few young people in Kakariko Village and so many Yiga Footsoldiers. – Groose from Skyward Sword is the ancestor of the Gerudo. He settled in the Lanayru Desert, which is filled with ancient and contemporary technology, because of his love of machines. It’s possible that Ganondorf is a reincarnation of Groose, which is why he was affected so strongly by Demise’s curse. 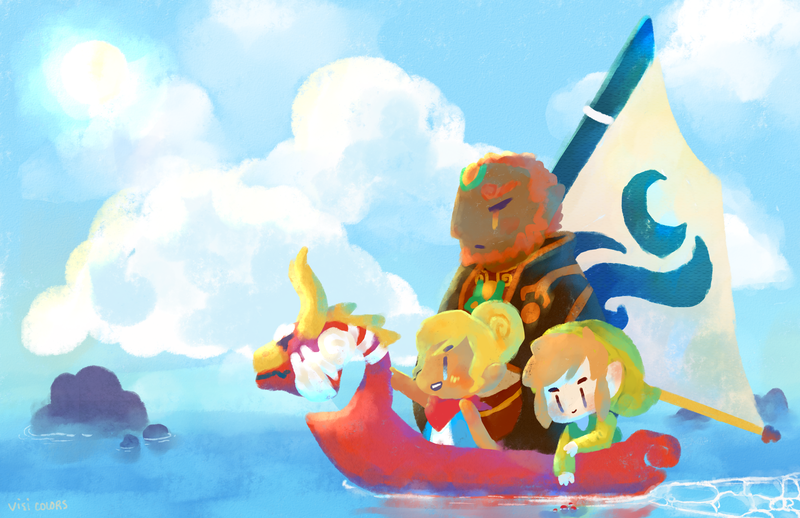 – Tetra’s pirate crew in The Wind Waker are all reincarnations of the royal aides whose group portrait hangs in Hyrule Castle. This means that Princess Zelda isn’t the only person whose soul is reborn in different eras of Hyrule’s history. – Agitha in Twilight Princess is Zelda’s sister, which is why she calls herself a princess. Like other princesses of the Hyrulean royal line, she experienced visions of a coming calamity, and these visions were so overwhelming that she lost touch with reality. She had to leave the castle for her own protection, but she is still wealthy enough to reward the hero who appeared in her visions for catching golden bugs that resemble the insects plaguing the Spirits of Light. – Because only one male is born every hundred years, the Gerudo in Ocarina of Time and Majora’s Mask reproduce through gynogenesis, which is similar to cloning. This explains the relative lack of phenotypic diversity among the Gerudo, as well as their comparatively large population. The pregnancies following unions with Hylian men result in more noticeable genetic permutations, including those resulting in the rare Gerudo males. – Link died while protecting Zelda during the Great Calamity that occurred one hundred years before Breath of the Wild. The Shrine of Resurrection created an entirely new body to house his spirit, much like how Ganon attempted to fashion a body for itself using the ancient technology hidden within Hyrule Castle. This is why Link is so weak when he wakes up, and it’s also why he has so much trouble remembering the past. – According to Hyrule Historia, the “Downfall Timeline” leading to the original 1986 The Legend of Zelda results from Link dying at some point during Ocarina of Time. The world of Termina in Majora’s Mask is a purgatory that Link’s soul moves through on its way to the afterlife. The four main dungeons and final set of dungeons on the moon are therefore meant to represent the five stages of grief (denial, anger, bargaining, depression, and acceptance). Everyone Link meets in Termina symbolizes an aspect of the trauma he experienced in Hyrule, and Link must help them in order to heal himself and pass on peacefully. – Super Mario Bros. 3, which Shigeru Miyamoto has said is a stage performance, is popular in Hyrule, which is why the Happy Mask Salesman in Majora’s Mask has a Mario mask on his backpack. The King of Hyrule in Ocarina of Time is a fan of the play, which is why there are paintings of Super Mario characters in his throne room. – The Oocca in Twilight Princess, who live in the City in the Sky, are the descendants of the Loftwings in Skyward Sword. The differences in their appearance and level of sapience are due to a divinely facilitated evolution similar to the event that transformed the Zora into the Rito prior to The Wind Waker. There is a related theory that holds that the Rito are the descendants of the Oocca, who used their technology to alter their appearance in order to better acclimate to Hylian society after the existence of their city became widely known in Hyrule. – Ghirahim, an anthropomorphic weapon who serves as the main antagonist of Skyward Sword, was created by Hylia, not Demise. Hylia knew that Demise would have to be unsealed in order to be defeated, so she created a copy of the Master Sword that would serve its own “master” by working to break the seal she placed on him. Unlike Fi, who remained in stasis while waiting for the chosen hero, Ghirahim gradually developed a personality, but his character became twisted by social isolation and his centuries-long failure to make progress on the task Hylia created him for, which could only be completed once her soul had been reborn. – The people who were exiled from Hyrule and became the Twili in Twilight Princess were originally Sheikah, as demonstrated by the Sheikah-style eye motif on Midna’s crown and Zant’s throne. Another theory holds that the Twili are what became of Ganondorf’s followers who were imprisoned in the Arbiter’s Grounds. – The Arbiter’s Grounds in Twilight Princess were built on the site of the Spirit Temple, the sacred site where the Gerudo in Ocarina of Time worshiped the Sand Goddess. The Hyrulean army destroyed the Spirit Temple during the war against Ganondorf and then made use of its ruins to build a concentration camp to house the Gerudo during a mass exile (or execution). – There is a fourth piece of the Triforce, which is actually the Tetraforce. The fourth piece of the Tetraforce is the empty center of the Triforce, and it is depicted at the bottom of the original Hylian Shield (which the developers supposedly redesigned in response to this theory). The Triforce can be split into multiple parts (as demonstrated by its eightfold split in The Legend of Zelda), and it split into four parts in Ocarina of Time. There are two common theories about what happened to the “missing” piece. One is that it is shared by the Great Fairies, four of whom appear in Ocarina of Time and Majora’s Mask. The other is that it seals away the darkness in Link’s heart and gives it physical form, which manifests as the Dark Link who appears in the Water Temple. – The Fierce Deity in Majora’s Mask is, as the eponymous villain says at the end of the game, “the real villain.” Majora gives the Fierce Deity’s Mask to Link in order to corrupt him, knowing that the mask will steal Link’s soul. The Link from Ocarina of Time appears to the Link in Twilight Princess in the form of a rotting corpse because he has been cursed by the Fierce Deity’s Mask and cannot die unless he is struck down by the Master Sword. – Every episode in the Legend of Zelda series is a dream experienced by the Link who wakes up at the beginning of each successive game. The entire series is therefore a dream inside a dream inside a dream inside a dream (including Link’s Awakening and Majora’s Mask, which are canonically dreams). – The Zelda series takes place in the same universe as the Silent Hill games. The Order, the evil doomsday cult that performs torture and human sacrifice in the town of Silent Hill, Maine, was originally a renegade faction of the Sheikah that was banished to another world like the Twili in Twilight Princess. The main basis for this theory is the similarity in the Satanic design motifs associated with the Order and with the Sheikah, which include staring eyes, magic circles, and bird-headed imps. – Linkle, the “female Link” who is a minor playable character in Hyrule Warriors Legends, is the daughter of Tingle, the green bodysuit-clad creeper best known for causing unnecessary delays during the Triforce Quest at the end of The Wind Waker. This implies that Tingle somehow managed to breed. Congratulations! Now you can never unsee it. You’re welcome!